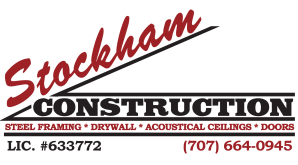 ABOUT US - Stockham Construction, Inc.
Stockham Construction, Inc. is a Commercial union company with over 35 years of experience. We specialize in exterior and interior metal stud framing, drywall, finish taping, acoustical ceilings, and commercial door installation. Stockham Construction is a Family owned and operated business with an emphasis on teamwork which has given us a reputation for completing projects in a timely and professional manner while delivering a quality product.